Kaija Saariaho (b. 1952) is today one of the world's most significant contemporary composers. In 2008, she was named 'Composer of the Year' by Musical America. In addition, she has received several internationally distinguished awards, including the Grawemeyer Composition Award for her opera L'Amour de loin in 2003. In 1997, she was awarded one of France's highest cultural honours, the title 'Chevalier de l'Ordre des Arts et des Lettres'. 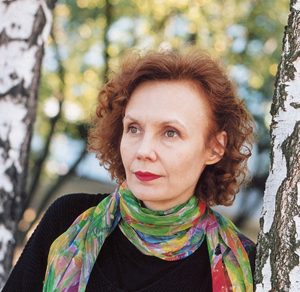 Kaija Saariaho has been commissioned by the BBC, Ircam, the New York Philharmonic, the Lincoln Center in New York, the Salzburg Music Festival, the Théâtre de Châtelet in Paris and the Finnish National Opera, among others. Kaija Saariaho frequently draws inspiration from extra-musical sources, be they the night sky, the natural environment or literature. Saariaho studied music and fine arts in parallel before taking up composition, the latter at the graphic arts department of the University of Art and Design Helsinki. She studied composition with Paavo Heininen at the Sibelius Academy from 1976 to 1981 and continued with Brian Ferneyhough at the Freiburg Music Academy, completing her diploma in 1983. Kaija Saariaho has been living mainly in Paris since 1982.